Today is Jonathan's and my fourth anniversary. I've set this to post. I'm on my way home from Texas today after having been with my parents for the past week. We've never been apart this long and no doubt (as I'm setting this to post a week in advance) it'll have been a horrifically long week apart. As I'm coming home, I just want to say HAPPY ANNIVERSARY to the man I love most in this whole world. You know, I can work up words for the deep emotions I feel about books or movies but no words are coming that would adequately express how much I care for Jonathan. So we'll do it with music (because he loves music). Happy anniversary to my ballroom dancing partner. (Yup. We ballroom dance. Our favorite dance is the waltz and although this particular song makes for a fast waltz, it's always been my favorite song to dance with Jonathan because the running phrase is true.) It IS you, Jonathan . . . I'm not a classical music fan (which I've stated before) and he is. This is as far as I go -- Andrea Bocelli. Basically what he's saying here is even when his love isn't with him, she really is. And wherever his love is and is going is where he wants to be. Yeah, same here. If I were picking a musical to express my feelings, I'd have to go with Cathy Rigby's Peter Pan (which is a big hit in this house). Tiger Lily says to Peter Pan: "Peter Pan is the sun, the moon and the stars!" to which Peter replies, "Yes, I know." And speaking of musicals (of which we both typically tend to be a fan) - here's one from one of the first YOU introduced me to - Dr. Jekyle & Mr. Hyde. And then here's the song we had sung at our wedding. And I know we both still mean that. Loved your post...choice of songs. How fun that you guys ballroom dance. I have to say... I love the song "It is You" and "Con Te Partiro" is one of my favorite Andrea Bocelli Songs. Happy 4th anniversary to you, too. Proverbs 12:4 says, "A wife of noble character is her husband's crown." I run out of words trying to describe the way you have been an incredible blessing and the way our marriage has transformed and created amazing things. 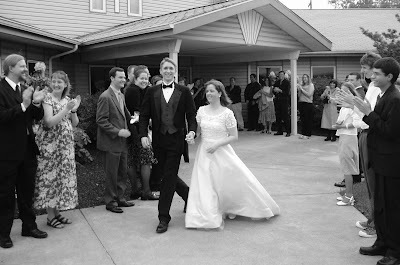 I know that "A prudent wife is from the LORD," and I thank Him every day for you. I love you! Happy Anniversary! You guys are so cute :D Good choice of songs. Happiest day to you guys!! Happy anniversary to one of our favorite couples! May this next year continue to draw you even closer together. Happy 4! You look so beautiful in the wedding pic! Happy Days to both of you! Congratulations and happy anniversary!! I love that you shared all the videos and interwove your thoughts with the songs, etc. I'm jealous that you guys ballroom dance. I don't think Steady Eddie would go for that here. ; ) May God grant you many, many, many more years together!!! I know that you all have had hard times lately, but I'm thankful that God has given you each other to help get through it. Happy anniversary! Way to go jumping out there and sharing your thoughts. Jonathan, you got a gem, and it sounds like Carrie did too! I hope you had a great 4th anniversary! A belated Happy Anniversary to you! Lovely collection of songs here! That Andrea Bocelli song is one of my all-time favorites. I'd not ever heard of the Jekylle and Hyde musical, but that song is lovely. LOVE that picture of the tango on the beach!